Betty and I are as fully prepared for this 16-day trip as we could be, in good health, well rested and intelligently packed. For many months, we have been looking forward to our first return to France since our last vacation there in the summer of 1990. Our Grand Circle Travel tour package includes three nights in Paris, seven nights cruising through Provence aboard the M/S Ravel riverboat and three nights on the French Riviera. In preparation for the trip, we had both taken a six-session course in Conversational French at the University of Memphis. I had changed several hundred dollars into French Francs at First Tennessee Bank in Memphis (at a good rate of 7.37 per dollar) and Betty had acquired a stash of American Express Travelers Checks. We had hideable wallets for our money and passports. And we had clothing suitable for possibly damp and cool Paris evenings and also the hot Mistral days of the Cote d'Azur. We had made arrangements to board our pet Greyhound, get the yard cut, plants watered and pool maintained. us extra legroom for the eight-hour flight over the Atlantic Ocean. I learned it's best to deal with the airlines yourself for seat assignments and to ensure frequent flyer mileage credit. There had been some back-and-forth with Grand Circle, which had first booked us on Northwest. That flight would have been good for us due to the direct Memphis-Amsterdam service that could have eliminated the horror-show that arose on our much delayed, return flights on Delta from Nice to New York, New York to Atlanta and then Atlanta to Memphis. But the exasperating - and exhausting - trip home and unplanned hotel stay in Atlanta cannot be blamed on Grand Circle. The airfare, transfers, hotel accommodations in Paris and the Cote d'Azur, guide services, most excursions, most meals and all the table wine at shipboard dinners were included in our package. Importantly, thorough planning and nearly all the arrangements had been handled for us by Grand Circle Travel, the tour operator. It is the first time we have ever participated in a group travel package, but the attractive prices and trip itinerary offered by Grand Circle made it seem like a good value and worth a try. The firm is a spin-off of AARP and specializes in travel for adults over 50. It claims to have served over 600,000 travelers, with a customer satisfaction rate of 95 percent. I can believe the claim. Despite a few disappointments here and there, ours was a great trip and we saw wonderful sights, had good experiences and made new friends we would never have discovered on our own. 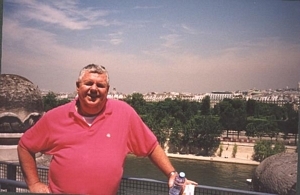 The cruise on the Soane and Rhone Rivers is one of Grand Circle's most popular packages. Even though we booked 10 months in advance, all the less expensive cabins on the M/S Ravel were already reserved. There were only a few, top-price cabins still available on the 60-cabin vessel, which measures 361 feet in length and 36 feet in width. So we ended up having to pay for an upper "Soprano" deck cabin with a private porch. The porch turned out to be a delightful luxury and a great vantage point from which to watch the river sights and passing countryside. The trip was my present to Betty for our 33rd wedding anniversary and was easily the most expensive vacation we've ever taken. But to our comfort and delight, we found that the first class facilities and services we enjoyed provided such a hassle-free, travel platform that it was worth every bit of the expense. Moreover, there is a good chance we will take another Grand Circle river cruise in the future, possibly the 16-day voyage from Amsterdam to Vienna. It was interesting to contemplate on the long flight to Paris how our tastes in vacations have evolved as we've moved through the life cycle and been fortunate enough to have expanded our means at about the same rate as our travel horizons. Our first vacations were in cheap motels and tents, all within a day-or two's drive. We graduated to camping in a borrowed tent trailer and then in our own camper, which we trailed thousands of miles during memorable trips to Maine and California when our son, Casey was a boy. Then came flights to Europe and Caribbean cruises (but always in economy accommodations). Later the enjoyment of our vacations more and more depended on our older bodies staying in comfortable, beach condominiums (both rented and our own). But the best part of travel still remains what we see and do for free or at little cost. What really turn us on are spectacular vistas of nature, great museums and art galleries and historic buildings and monuments. We usually enjoy coming in contact with different people and cultures. Cheap travel in our 20s and 30s gave us a chance to see a lot of the world few of our peers have ever seen. But now that we are in our late 50s, sleeping on the ground and cooking over a wood fire has zero appeal. Despite the extra legroom of bulkhead seating, the all-night flight to Paris was exhausting. The plane was full and Delta's low-fat meal option proved to be a bad choice. What little sleep we were able to catch was fitful. The plane arrived at Roissy - Charles de Gaulle Airport on the outskirts of Paris at 8:20 a.m. A Grand Circle representative, who collected several couples arriving on different flights at about the same time, met us. We were escorted us through Customs without having to stop for inspection and to a large, tour bus that had its motor and air conditioner running. We waited and waited for other Grand Circle travelers to arrive and board the bus and visited with a couple from Brandon, Miss., Clyde and Maureen Staley, who were also taking the river cruise. A charming and enthusiastic young French woman introduced herself to us. She was Katell Le Bourdonnec, who would be our tour director for the next two weeks. Once the bus was nearly full, we at last departed for the 50-minute ride through traffic on the Peripheque to downtown Paris and our hotel. During the drive, Katell called our attention to various points of interest, including the huge soccer stadium where the French team won the World's Cup in 1998. We learned that Katell was born in Brittany (the last two letters of her name and heavy accent are supposedly a dead giveaway to her origin to other French) and that she has achieved her ambition of living and working in Paris. She had studied tourism and was fairly proficient in English. It turned out that she "loves Elvis" and has been to Memphis on two occasions to visit Graceland with a friend. Small world. I later gave her an "Elvis Presley's Memphis" lapel pin, which came from the restaurant by that name on Beale Street. She seemed to be very pleased with the trinket and told us she would call when she next visits Memphis. Katell told us that, unlike in America, young adults in Paris rarely live with their parents or even with other roommates. They much prefer having their own places, even if tiny and located in a scruffy area. It was plain to see that young Parisians put more of a premium on their appearances than do many Americans of the same age. Many of the women - of all ages - are blade thin. Hardly any young men - and very few of the mature men - have potbellies. If you see much body fat, it's a safe bet that the person carrying it is a tourist and probably from the U.S. or Italy. Except in the tourist areas, where ragtag Americans hang out and litter the otherwise tidy streets and public places, Paris is a dressy place. Parisians are much more formal than Americans, with adults unfailingly referring to other adults as Monsieur, Madame, or Mademoiselle. Our hotel was the 1,000-room Concorde La Fayette, a contemporary, 33-story hotel at 3 place du General Koenig, about a five-minute walk from the Arc de Triomphe and Champs Elysee. It reminded me of a Hyatt Regency - without the ice, Coke and snack machines on every floor. The rack rate is $400 a day. The room TV has programming in French, English, Arabic and German. There are two restaurants within the hotel. Connected to the hotel is a two-story shopping mall, with other eating places and some luxury apparel and jewelry shops. Also connected are office buildings, a health club and a convention center, the Palais des Congress de Paris, where bluesman B. B. King was headlining a festival series of master guitarist performances the next week. We arrived at the hotel before 11 a.m. and met Katell's co-tour director, Helene Clement, another charming, young Parisian. Her English was excellent and almost accent-free, thanks to most of a year spent studying in Ireland. 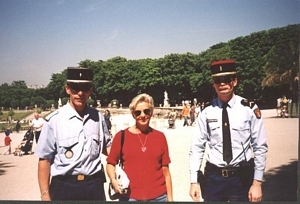 She said many French families realize the importance of speaking English well and gladly make financial sacrifices so their teenage children can study diction and slang phrasing in Great Britain, Ireland and the U.S. We also met Margaret Thoren, a mature woman who seemed to be Grand Circle's boss lady in Paris. She had to deal with several dozen tired customers who were annoyed about a lengthy delay in getting rooms. 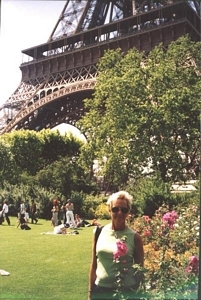 We were told the Paris Air Show running that week resulted in slow checkouts and heavy demands for rooms throughout Paris; I thought the hotel was understaffed, particularly after seeing we never got washcloths or a bedspread in our otherwise well-appointed room. Margaret & Co. suggested lunch in Les Saisons, a restaurant attached to the hotel. It was the only bad advice we had from the Grand Circle staff. We sent back our "vegetable soup" that was really a rich cream of cauliflower semi-liquid that looked and smelled as unappetizing as it sounds. A simple sandwich with water and an uneaten salad of beets and other funky stuff ended up costing us $15 each, doing nothing to improve our crankiness. We were denied the "discount" Grand Circle claimed was given its customers. We also killed some time by taking a quick "orientation tour" around the immediate vicinity of the hotel, where a Grand Circle guide showed us where to change money, buy stamps, catch a bus or subway and several recommended restaurants. It was a worthwhile walk of 30 or so minutes. We finally got into our room on the 12th floor a little after 2 p.m. Betty took matters into her own hands and over the objections of hotel staff, retrieved our two large bags from a pile on the sidewalk rather than continue waiting for bellman delivery. We napped for a couple of hours. Some of our fellow passengers who were either able to sleep on the transatlantic flight or were hardier than us went out to explore Paris for the afternoon. Feeling somewhat refreshed after a nap, we attended Grand Circle's welcome party at the hotel that evening. We mingled with more than 100 of our fellow passengers and made a meal out of finger food and salads. I was introduced to Kir (pronounced keer, rhymes with beer), an apéritif consisting of a splash of black currant liqueur such as Crème de Cassis topped with white wine. Even better is Royal Kir, made with the elegant liqueur Chambord and Champagne. We were possibly the youngest couple in the group. I was 58 at the time of the trip, with Betty a little younger. I'd estimate average age on the tour was 65, with some passengers in their mid70s and beyond. There must have been 50 couples, with the remainder of passengers a sprinkling of singles. There was one teenage girl traveling with her grandmother and also a young woman sharing a room with her mother. There was a single woman in her 40s who was by herself and a few gray-haired women traveling with female friends. All in all, this group was an extraordinarily active, energetic bunch, with many well-experienced travelers who had been all over the world. Most were determined to see everything they could. And they did. Outside of the Staleys of Mississippi, we were the only couple in the group who lives in the South (I don't count people who retire in Florida as being Southerners). And the Staleys were transplanted Pennsylvanians. After the welcome party broke up, we walked around the neighborhood for an hour or so, admiring the architecture and numerous sidewalk cafes. Our hotel is in a commercial center of Paris and there is a lot of corporate activity bustling about in the immediate vicinity. During the day most people we saw on the street and at the sidewalk cafes were in upscale office attire. Our 12th Floor room faced the Eiffel Tower, which is a magnificent sight at night when the floodlights are on. It is spectacular when the 20,000 twinkle lights are turned on for five minutes every hour until 1 a.m., when all but the aircraft navigation lights are turned off. A few weeks later, that flashing sparkle disappeared from the Paris skyline until early 2003. The New York Times reported Aug. 26, 2001, that mountain climbers had begun removing the flashing light bulbs - installed as a short-term millennial attraction for the year 2000. The newspaper reported that "the 984-foot-tower is scheduled for repainting next year, and long-lasting flashing bulbs, good for 10 years, will be installed when that is finished. The tower will still be open to visitors throughout the work, using its pre-2000 lighting." We also had a view from our hotel window of the Arc d'Triomphe, which like most Paris monuments, bridges and grand buildings is bathed in soft floodlights all night long. Despite sleeping for 10 hours, I was still feeling jet-lagged upon arising. A $22 buffet breakfast at the hotel's Arc-en-Ciel restaurant was included so we took advantage of it. It was obvious the Concord la Fayette caters to an international clientele. The buffet offered a splendid array of food choices including American favorites like sausage and scrambled eggs and the Continental selections of breads, cheese and fruit. Grand Circle takes a lot of rooms on behalf of their customers, as do Delta, American and other airlines on behalf their flight crews. Since we had spent most of a week in Paris on an earlier trip, we passed on the Grand Circle excursion bus tour of the city, preferring to poke around on our own and revisit the Musee D'Orsay. 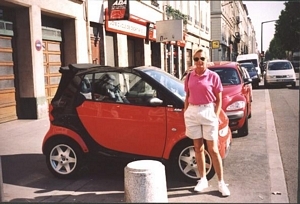 Outside of overly-long tour bus rides between the Paris and the boat embarkation point and later between the boat debarkation point at Cote d'Azur, we were generally free to choose whether to participate in numerous group excursions and events or to go off on our own. We passed on all but a few group activities even though we genuinely enjoyed the company of nearly all our fellow passengers. A couple of dozen people had opted for a pre-Paris, three-night trip extension to Blois and the Chateau region of the Loire Valley offered by Grand Circle for $395. Several opted for a post-cruise package extension of two nights on the Cote d'Azur for $295. Once you're there, it's a pretty good deal if you've got the time. And since retirees are Grand Circle's customer base and have plenty of time, many take advantage of the extensions. We had driven through the Loire Valley and spent a night in Blois on our earlier trip and didn't want to see it all again. The Riviera extension didn't appeal to us either, mainly because we knew we would be ready to get back home by then. Our basic package included 10 sightseeing tours - Paris, Dijon, Beaune & Burgundy (all day including wine tasting), Lyon, Vienne, Viviers, Avignon, Arles, Aix-en-Provence and Monte Carlo Casino & Nice (all day). Most featured local guides and rides on modern tour buses equipped with a rest room. A few were walking tours of an hour or two. There were also several optional tours that required payment. Among them were a dinner and show at Paris' Moulin Rouge and all-day excursions to Monet's home at Giverny and Versailles. Later there was an optional steam train excursion to the Doux Valley Gorges in the Ardeche region. students, we purchased a "carnet" of tickets for 52 Francs (about $7) at a tobacco shop across the street from the hotel. Each ticket in the book of 10 could be used for complete, one-way trips on the city's 2,000 buses, Metro and RER trains, including transfers. A single ticket costs 8 Francs (nearly $1). Passengers must time-validate each ticket in special machines when boarding; the fine for riding without a properly validated ticket is 150 Francs. The tickets are sometimes needed to exit station turnstiles. We spent way too much time in the Musee D'Orsay, but there was so much to see. reaches of the former train station. D'Orsay specializes in 19th Century art and has perhaps the finest collection of French Impressionists in the world. The collection covers the years 1848 (the Second Republic) to 1914 (World War I). It was a great treat to see the works of Monet, Manet, Cezanne, Degas, Van Gogh, Pissaro, Gauguin, Rousseau, Seurat, Renoir, Rodin and others. One dimly lighted room contained a dozen paintings by Toulouse-Lautrec, including several of cartoon-like characters featured on posters in the Guardsmark collection back in Memphis. I purchased some souvenir Lautrec coasters for Guardsmark's CEO, Ira Lipman. The stone floors and long stairways took a toll on legs and feet. Before entering the D'Orsay we had to wait in a long line for 20 minutes. Museum workers, like their counterparts at the nearby Musee Du Louvre, have been intermittently striking for several months. The issue was their desire for a 35-hour workweek (during my corporate career I'd pass 35 hours on most Wednesdays). I think the long wait to get into the D'Orsay was partly due to pent-up demand. Once inside, the cavernous museum easily swallowed the hundreds and hundreds of visitors and didn't seem crowded at all. Since our last visit a decade ago, a restaurant and two "express" eating areas have been added. An observation deck on the sixth floor has also been opened, offering a great view of the Seine River and much of Paris. With only two full days in Paris, we had decided not to re-visit the Louvre. It has the largest collection of great art in the world, encompassing everything from Pharonic tomb painting to Picasso. We remembered from our last visit that the size of the former palace of French kings is simply overwhelming, far beyond anyone's capacity to see in a meaningful way within a day. We walked a few blocks to catch another bus to the Luxemburg Gardens, formerly a palace and grounds. It is now the equivalent of New York's Central Park. Thousands of Parisians come to the park to sun bathe, sail tiny boats in a basin, read and meet with their lovers. The gardens' formal plantings of flowers are framed by long rows of leafy Poplar trees with tops trimmed to box-like shapes. The trees, looking like columns of soldiers, shade gravel paths as wide as a residential street. Special playgrounds for children are protected from loose dogs by low fences. The playgrounds are well equipped and include large sandboxes, which are well used. Luxemburg Gardens is a good ways from the tourist areas and I had the feeling that nearly everybody enjoying the park on this day were natives. Adjacent to Luxemburg Gardens is another shady park with a fabulous bronze fountain that is perhaps 100 feet across. Regrettably, just as we arrived a maintenance crew turned off the jets that spouted huge volumes of water from the fountain's metal animals and fish. The park is named in honor of the explorer de La Salle, discoverer of what became France's Louisiana Territory, sold by Napoleon to President Jefferson to help finance his war with England. The entire park is forbidden to dogs, which seemed unusual in this nation of canine lovers. The French love their dogs, called "chein." The animals are extraordinarily well behaved and their owners take them on leashes everywhere, including restaurants. The great majority of Parisians lives in apartment or condominium buildings and have no yards for their pets to exercise in or to eliminate waste. They walk their dogs on city sidewalks and (at least in the upscale parts of Paris) clean up after them with the help of "pooper scooper" plastic bags available in curbside containers. We saw a young woman swat her Lab for peeing in the wrong place. The French don't allow their pets to "mark" territory like male American dogs try to do at every bush, pole and fireplug. Most of the dogs we saw were small or medium size. We didn't see a single Pit Bull or Doberman and only a few German Shepherds and Rottweilers. We also didn't see any Greyhounds, our favorite breed now because of our much-loved pet, Dickens, a retired racer we adopted a year ago. I am struck by how well kept are the French boulevards, neighborhood parks and other public areas. There are flowerbeds and hanging baskets everywhere. It's easy to tell where the Americans hang out, like in the park area around the Eiffel Tower where litter abounds. We saw very little broken glass or other debris on the streets. But there were plenty of weathered cigarette filters filling the nooks and crannies in this city of heavy smokers. Anti-smoking programs have only recently become a priority in France and prohibitions against smoking in some public areas seem to be unenforced. However, we did discern a significant reduction in smoke-filled restaurants compared to our last trip. Even though the French driving seems to be a Gallic "everyman for himself," the traffic seems to move at least as well as it does in New York. Astonishingly, the Paris streets by and large don't have lane markers. That might because many streets are paved with cobblestones that can be centuries old, with asphalt filling in the gaps. An American has a hard time grasping just how old this city is. We passed under one wide, arching bridge over the Seine River that was built of massive stone blocks in 1604. The English were just starting to settle the American colonies back then and were probably fording rivers on horseback. According to Grand Circle's wealth of background information on the places we visited, Paris was founded towards the end of the 3rd Century BC by a tribe of Celtic Gauls known as the Parisii. Julius Caesar's Roman legions took control of the territory in 52 BC and the settlement became a Roman town. In 508 AD, a century after Rome fell to the Visigoths, the Frankish king Clovis I united the Gauls and made Paris his capital. Much of the layout of modern Paris is the work of Napoleon Bonaparte and Napoleon III in the 19th Century. much smaller (and gasoline much costlier) than back home. We saw several tiny "Smart Cars" made by Mercedes-Benz that could fit into the back of the largest Ford SUVs. We also saw lots and lots of motorscooters (some with abbreviated roofs), light motorcycles and bicycles. Some were driven by women and some by men wearing suits. Cyclists seem to be respected as they peddle along the edges of the streets, oblivious to the vehicles that give them a decent berth. Cell phone use seems to be even more endemic among the French than among Americans, particularly by young women. We saw one young woman happily talking on her cell phone as she rode her bike one-handled on a busy street. Because the weather was nearly perfect - with generally sunny skies and daytime temperatures in the 70s, walking the busy boulevards, window shopping and watching the stylish Parisians was quite enjoyable. In contrast to our last trip, we saw virtually no "bare bosoms" featured in advertising. A decade ago, photos of bare, female breasts were displayed on posters, magazine covers and television - even selling tires. Perhaps the European Economic Community movement has brought a bit of prudishness to this country where romance is such an obsession. Youthful appearance is a focus and a way of life here. Most women we saw in the fashionable 17th Arrondissement were thin and dressed in attire that was quite feminine. There was none of the U.S. "corporate klunky" or grunge in sight and none of the women wore mannish suits, low heels and floppy bow ties. The only Army surplus or camouflage clothing we saw was in the tourist areas frequented by teens who seemed to be American or German. Every commercial street we saw was dotted with cafes, bars, brasseries and restaurants. Eating out is a big deal here and the French supposedly spend a higher portion of their income in restaurants than do any other people in the world. While McDonald's has attained a foothold (one outlet is within sight of the Arc De Triomphe on the Avenue des Champs-Elysees) in Paris, the city has very few fast food places. An hour or more at table seems to be the standard for lunch. The evening meal - which never begins before 7 and more likely will start at 8 or later - may take two hours. The French think the American habit of jump-and-grab eating is crazy. Many Americans consume much, much more food in much less time than do the French, probably a big reason why obesity is such a national problem in the U.S. Most of the men we saw in Paris looked as though they take their appearance as seriously as do the women. They are typically slim, reminding me of military officers. Paris lends itself to walking and men generally wear comfortable shoes. Parisian women appear to prefer style to comfort in their footwear even though they, too, walk a lot. I've read - and observed - that the French generally eat far more sparingly than do most Americans. Servings are smaller. A restaurant portion of fish or meat in France is perhaps half the size of that served in the U.S. Supposedly the French make it a practice to not snack between meals, probably the reason for the paucity of the "calorie machines" that are everywhere in America. Our 1,000-room hotel had only one Coke machine and one snack machine, and both were housed behind a closed door marked "Flight Crew Lounge." It likely was installed for the wide-bodied employees of American airlines. During our stay, humorist Dave Barry wrote about the French approach to eating in the International Herald Tribune (a joint venture in Europe by the New York Times and Washington Post). His column, which also runs in many U.S. newspapers, got many laughs when it was passed around our tour group. Barry wrote that on market day the French "buy delicious, inexpensive cheeses, sausages, breads, pastries, candies and other delicacies. Then they go home and throw all the food away. At least that's what I assume they do, because, despite living in Cholesterol World, they're all thin. The entire population of France weighs less than a standard American softball team. . ."
Two rail-thin Gendarmes politely tried to understand my mangled French and gave us excellent directions on how to get from Luxemburg Gardens to the nearest RER subway (Paris is served by two underground services, RER and Metro, with RER extending its lines beyond Paris to the suburbs). 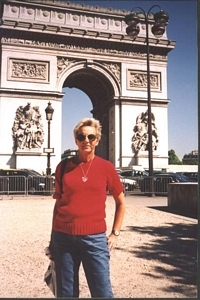 We walked two or so blocks to the station and took the subway to the Chatelet stop and easily transferred to another train, which took us to Charles De Gaulle Place and the Arc de Triomphe on the Champs-Elysee. We decided to walk the mile or so to our hotel down the 253-feet-wide boulevard that morphs into Grand Armee, passing several motorscooter and light cycle dealerships and many cafes along the way. * Le Bistro Saint-Ferdinand (A French tavern with traditional French cuisine, English speaking staff. English menu available, from 189 Francs, drinks included). Based on the recommendation from Grand Circle, comments from another couple and our introduction to French mussels on our earlier trip, we decided to dine at Leon de Bruxelles, a chain with a dozen restaurants in Paris and a dozen more scattered about in France. It was a great choice. Leon's specializes in "les moules," or black-shelled, saltwater mussels gathered from the cold water coasts of Brittany and Normandy. We were each served an enormous bowl of mussels steamed in water spiced with garlic, butter and celery. They were absolutely delicious and came with French fries, fresh salad and choice of a glass of beer or wine. Our bill - including tip - was a paltry $32. Who says you can't eat well in Paris without spending $200? That night, we again marveled at the fantastic view from our room of the twinkling lights of the Eiffel Tower that made it look like a giant sparkler. After a leisurely buffet breakfast and relaxing morning, we ventured out again and rode a city bus to the Eiffel Tower, the signature structure of Paris. Built for the 1889 World's Fair to commemorate the centenary of the French Revolution and named for its designer, Gustave Eiffel, the tower stands 1,050 feet high. It was the tallest structure in the world until 1930 and was nearly torn down in 1909. It was saved from demolition when its lofty height was ideal for antennas serving the new technology of radio broadcasting. The crowds were heavy on this beautiful day. There were only a few dozen visitors on the damp day we visited the tower 10 years ago. We had enjoyed a great view from the first platform after riding an elevator up several hundred feet. But on this day, tour buses were stacked up on the approaching streets and thousands of persons were in and around the tower. The lines waiting to buy tickets to ride the room-sized elevators were several hundred people deep. Though free, walking up the stairs was out of the question. So we poked around the rose gardens and bought postcards at a tower shop. 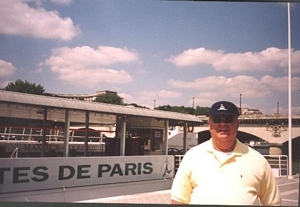 With several excursion boats docked on the Seine River right at the Eiffel Tower, we decided to take an hour-long ride. We passed on the Bateaux Parisiens vessels and the luxury Bateaux Mouton meal cruise boats because they were thronged with grade schoolers on class outings. Ironically, the one we chose was part of the Vendettes de Paris fleet of economy-priced, open boats, the same operator we chose 11 years. We again passed under nearly 20 bridges, most made in graceful arches of stone blocks. Several were decorated with sculpture from the Empire Period and gold leaf. Buildings on or near the riverbank included Notre Dame Cathedral and its flying buttresses, the 12th Century grande dame of medieval cathedrals we had toured on our last trip. Sitting on the benches along the river or reclining on blankets or towels on the paved riverbank were dozens of swimsuit-clad sunbathers, who studiously ignored the waving tourists on passing boats. With an early start the next morning (our bags had to be outside our room door at 6:30 a.m. for the porters to load on the three buses), we decided to eat light this evening. We had an early and thoroughly unremarkable supper of chicken and ham sandwiches at an Italian restaurant inside the mall attached to our hotel. Still jet lagged, we napped for a couple of hours then arose at 9 p.m. and walked around the bustling neighborhood. It was remarkable how many people were dining on tiny tables that spilled out of the cafes onto the sidewalks.